LOS ANGELES -- "Spotlight," ''Straight Outta Compton" and "The Martian" were among the 10 feature film nominees announced Tuesday for the 27th Producers Guild Awards. Conspicuously missing were critics favorite "Carol" and "Star Wars: The Force Awakens," a wild card thus far in award races. The Producers Guild nominees reflected a diverse lot of films, including favorites such as the investigative journalism pic "Spotlight;" the star-studded financial crisis comedy "The Big Short;" and the high-octane "Mad Max: Fury Road." More populist crowd-pleasers like Ridley Scott's space adventure "The Martian" and the N.W.A biopic "Straight Outta Compton" were also nominated, as was the revenge epic "The Revenant." Surprises include a few well-reviewed films that were considered underdogs in the awards race - the border drama "Sicario," the artificial intelligence thriller "Ex Machina;" the Cold War thriller "Bridge of Spies;" and the immigrant romance "Brooklyn." PGA nominees have historically been a solid indicator of films that ultimately received Academy Award nominations for best picture. Last year, "Birdman" won both the PGA and the Academy Award. 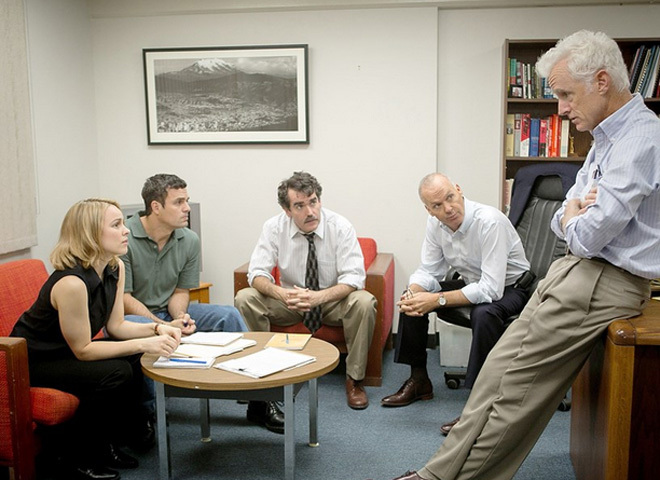 This year, Oscar front-runners seem more elusive than ever to determine, aside from a strong consensus around "Spotlight." Aside from "Star Wars" and "Carol," many other Oscar hopefuls were left out of the PGA lot. Among them were Lenny Abrahamson's "Room," which is expected to get star Brie Larson a best actress nomination; Quentin Tarantino's bloody Western "The Hateful Eight;" David O. Russell's miracle mop inventor pic "Joy;" and Ryan Coogler's continuation of the Rocky Balboa saga "Creed." There were no surprises in the animation nominees, though, which included "Anomalisa," ''Inside Out," ''The Good Dinosaur," ''Minions" and "The Peanuts Movie." Feature documentary nominees were previously announced and include "Amy" and "The Look of Silence."